Scott Almes has another game on Kickstarter. Yep that is right. Another one. That’s like 15 this year. This one is from Tasty Minstrel Games. It’s called Harbour. 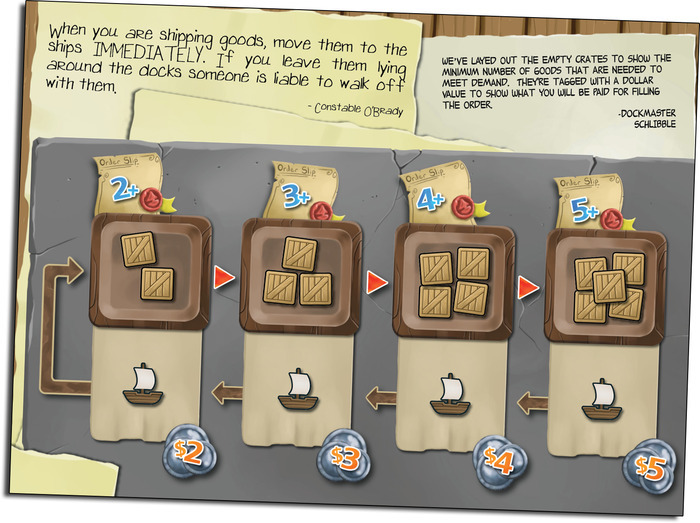 In Harbour, players are entrepreneurs constructing buildings on the harbour of their city. These buildings produce goods which are sold to make money. Money is used to build more buildings. Rinse repeat until one player has built four buildings. That triggers the end of the game. The players add up the points from their buildings. High score wins. That’s the simple explanation. Harbour is a small worker placement game. Players have one worker that is moved to various buildings each turn. Those buildings have abilities such as gain one good, build an extra building, and many other abilities. Players use these abilities to make goods to sell, build more buildings, or break the rules in some way. The ‘beauty’, if you will, of the game lies in the market. The market controls the price of the goods. And the money players earn for selling the goods. And money is what is needed to build. Prices fluctuate constantly based on what is being sold. See when something is sold its value decreases immediately. It is moved down the market board to the lowest value and everything else is moved up. So planning is this game. One minute your fish are worth $5. Then someone sells fish and those 6 fish you were planning on selling on your turn are worth only $2, wrecking your plans. Tasty Minstrel Games is marketing Harbour as a microgame. It’s a deck of standard sized building and character cards, some cubes or tokens, and a couple of small player boards. Does that qualify it as a microgame? I’m not getting into that. It suffices to say that it is a small game. While I’m on components I’ll talk about the art. It’s fantastic. Artist Rob Lundy’s whimsical style is definitely adds to the value of the game. So at its heart Harbour is a fairly strategic worker placement game that has a small footprint, is easy to learn, and is a quick, fairly satisfying filler. 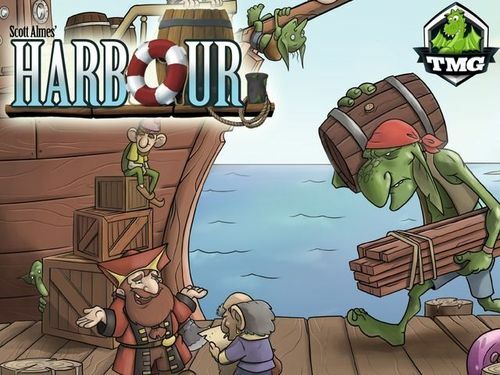 Thanks to Tasty Minstrel Games for providing a preview copy of Harbour.